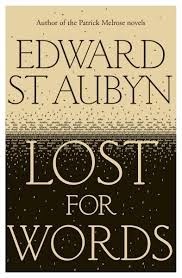 St Aubyn's magnificent Patrick Melrose novels have led us to expect sparkling, lively prose from this superb wordsmith and he doesn't disappoint here. The crispness and precision is all there - there's not a word out of place. It's writing of the highest order. 'It's a prize for literature', said Mr Wo. 'I hope it will go in the direction of literature...Personally I think that competition should be encouraged in war and sport and business, but that it makes no sense in the arts. If an artist is good, nobody else can do what he or she does and therefore all comparisons are incoherent'. 'Evidently..we are in the presence of the text-as-textile, as the fabrication that weaves a dissimulating veil over its apparent subject, expressing the excess of figurative language over any assigned meaning or, more generally, the excessive force of the signifier over any signified that tries to contain it'. The febrile, desiccated and corrupted British establishment bumbles along, lauding 'relevance', indulging in a lazy populism, and trashing England's unique literary and cultural heritage in the process, leaving space for Russian thugs on the one hand and Chinese corporate interests on the other. Ironically, at the Awards Dinner, the Chinese CEO of the sponsor company and his highly intelligent wife seem the only literate adults in the room.